Being an ally is a very challenging thing. It’s easy to say, “I’m an ally, I support you.” It’s very difficult to follow through on that. There are many ways I try to be an ally and often feel I fall short. I also get easily frustrated with alleged allies who choose not to measure up to the title. I’d like to highlight Dr. Jones’s six rules with some of my own thoughts as well as some current events from as early as a few hours ago. You can read the full text of her speech here (PDF). Rule #1: Allies know that it is not sufficient to be liberal. In fact, the liberal position is actually a walk backwards. This is probably the hardest one. It’s a challenge both for allies as well as for those in-movement. I think today we saw an interesting juxtaposition between the HRC rally and the GetEqual direct action. HRC had Kathy Griffin who was taping for My Life on the D-List, and really, who cares? 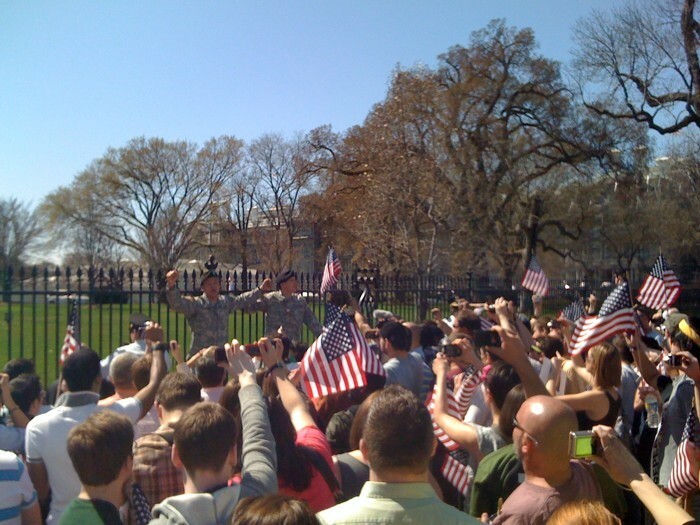 Lt. Dan Choi showed up and was like we can do better than a rally and went over and chained himself to the White House fence. He and two others were arrested (Towleroad has updated coverage here). The difference between the two is striking. Allies who really care about standing up for oppressed groups have to do more than vote for democrats. Sometimes it takes more than just showing up at the rally! Action has to be taken. (Photo courtesy @piconico). Rule #2: Be loud and crazy so _____ folks won’t have to be! This is so true. I think many allies simply wait to be told by the oppressed group what they should do. What a difference it would make if groups didn’t always have to advocate just for themselves. In a way, this should be kind of obvious. Allies should care at least as much as any member of the group they are trying to be an ally to. I was excited to see a Bilerico-led blog swarm today calling for passage of ENDA. Despite my impatience at employment inequality though, I have my reservations about the effectiveness of such a swarm when Congress is already being inundated with feedback on healthcare reform, which is why I haven’t actively participated. I did try calling Speaker Pelosi’s office, only to get a busy signal and then no answer. But look at the participants in the blogswarm. It’s almost all the LGBT blogs you’d expect, which is great, but where are our allies? Daily Kos is apparently participating, but you can’t even find the swarm on the homepage! It shouldn’t be up to just the same old folks to be advocating against the same old inequality. Rule #3: Do not tell anyone in any oppressed group to be patient. Doing so is a sign of your own privilege and unconscious though absolute disregard for the person with whom you are speaking. I couldn’t agree more. And the cry of “wait!” takes many forms! The waffling and call for more studies on repeal of Don’t Ask, Don’t Tell is a great example. Anytime you hear “We’re not ready yet” or “We have to study this more” is just an excuse to delay justice. I’ve written on this one before, so I think we can move on. Rule #4: Recognize the new racism, the new sexism, the old homophobia. It is institutional and structural… The absence of ____ in any space cannot be accounted for by chance or accident… Allies know that racism, sexism, and homophobia are real and NEVER tell people, “You could be wrong, you know.” Such a statement presumes that you have greater insights than those with lived experience inside of multiple oppressions. This is also a difficult one, and one that I know I’ve definitely struggled with as a white man working to be a better ally. I think back to my recent outcry about the way my identity was edited out of my local newspaper. It really doesn’t matter if I’m wrong, I can’t change that the way my identity was edited out is only one of many microaggressions I have experienced for being gay. Seeing that incident as an attack on my identity is the only way I can see it, because I have to constantly be on guard for such attacks. Rule #5: When called out about your racism, sexism or homophobia, don’t cower in embarrassment, don’t cry, and don’t silently think “she’s crazy” and vow never to interact with her again… Be grateful that someone took the time to expose yours—remember, exposure allows the wind to whip away isolation and fear. Exposure is a step toward freedom. Allies welcome an opportunity to see how their choices, ideas, words may be erasing those around them… Allies want to know when they have been contributed to the very oppressions they oppose. Allies know they are not above reproach. I try to relish opportunities to admit that I’m wrong. That’s why I’m so willing to put myself out there. I can’t be afraid to be wrong, because then I will never learn and grow. For example, I was totally against the National Equality March as it was getting organized. It seemed like it was not actually organized at all, I bought into what a lot of the big groups were saying about it, and it just didn’t seem like it would be effective. As it came together and I chose to participate, I saw just how important this new way of thinking about activism was. I saw how my socioeconomic privilege was actually clouding my ability to truly appreciate the importance of grassroots efforts toward queer equality. I was wrong for opposing it, and I’m glad I figured that out before it was too late. There’s a reason I always encourage people to comment on my blog. I like to hear when people disagree with me! I like to argue and work through new understandings. I hope that as an activist and ally, I am not above reproach. Rule #6: Allies actively support alternative possibilities… because allies believe “the master’s tools will never dismantle the master’s house,” allies consider the transgressive power in alternative academic strategies, a power that works to undo patriarchy, white supremacy, the insatiability of capitalism, and heterosexism. Supporting alternative possibilities is the only way we can all dream ourselves into the world in which we want to live. This is another one of the reasons I was mad about my newspaper’s censorship. I knew that my opportunity to perform was an opportunity to offer a liberated message, as it was for my graduate capstone. At the performance last night, I successfully did it again. My opening monologue included some vague allusions to my gay identity and I also sang “Maybe This Time,” complete with male pronouns, and people left the event asking if I was gay or not, because they weren’t sure. That was specifically my intent, and I was successful, but it would have made a lot more sense if the proper context had been set up in the article. This also makes me think about how the rest of my professional field might feel about my blogging, as I wrote about last October. For higher education, blogging is still a unique medium. It’s not an academic journal, nor should it be read as one. There are surely folks who do not appreciate what I write, because it is not their tactic. Similarly, I disagree with the way social justice education is so focused within the academy and our professional organizations rarely speak outwardly about the values they claim to uphold. I’m proud I have this venue to creatively share some fresh points of view and get people thinking in new ways, as well as to push myself to continue to learn and think in new ways! Being an ally is tough, and I know I feel very refreshed by Dr. Jones’s words. They present new challenges for moving forward, but I’d rather struggle toward liberation than settle for oppression.